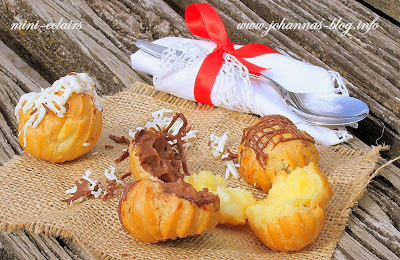 A classical French recipe and a great dessert filled with vanilla and cocoa cream. Put the water, butter or oil and salt into a medium-sized pan and heat until the butter has completely melted. Then bring the mixture to the boil and add all the flour in one go. Immediately start rapidly beating the flour with a wooden spoon while removing the pan from the heat. The mixture will look messy at first but will soon transform into a smooth and heavy dough. Leave it to cool a little then add the eggs one at a time (the dough shouldn't be hot, because the eggs could coagulate) stirring with the same wood spoon. Finally you'll get a soft, glossy dough. 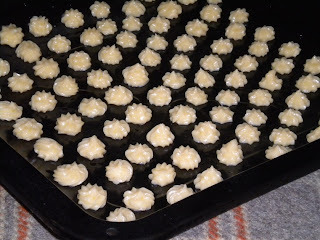 With a pastry tube and a tip, pipe the dough in small balls on the greased tray. Make sure that you leave spaces between the balls of dough because it doubles the volume after baking. Put the tray in the pre-heated oven for about 20 minutes, at a medium to high temperature (450 F or 180-190 C). When ready, gently remove the mini-eclairs with a knife from the tray and leave them aside to cool. The fillings - whisk the milk, sugar and flour then put it in a bain-marie pan (the pan with the mixture stays in another pan with boiling water) whisking with a hand whisk. When it boils whisk almost all the time, because if you don't, the cream may stick to the pan bottom. Add the vanilla essence and let it boil until the composition starts bubbling. At this point, if you take some of it on a knife blade it should stay firm and easily removes from the metal. Remove the cream from the heat and then add the butter. When the composition is homogenized, separate in two and add the cocoa in a half of the cream. 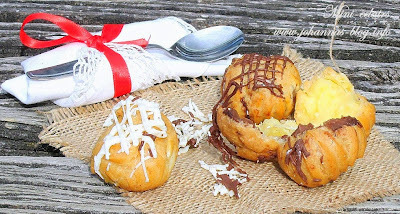 When the mini-eclairs are cool, cut down the length of one side of each eclair and pipe in the vanilla and cocoa cream. When all are filled, melt each chocolate bar (of 80-100 g each) in 2 tbsp. of milk and 2 tbsp. of sugar on low temperature until the icing is fluid. Then decorate the mini-eclairs, let them cool and serve. Yum! !......I'm off to make them!! These look so good, can't wait to try them!! 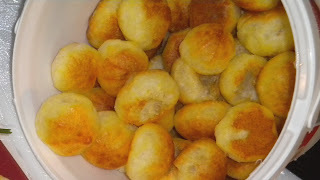 They are quite easy to make, just try !